At Hog Roast Bramhall, we truly can cater for any type of event, and over the years we have hosted everything from outdoor adventures in the cold, to warm, intimate evenings at home. The key to our success is preparation! We meet with you the customer prior to your event to discuss the particulars, such as choice of menu, number of guests and details of venue, and make personal recommendations tailored to you. But preparation on the day is also key, as it takes time to roast meat to perfection, so our professional chefs will be on site nice and early to allow plenty of time to prepare the space and the food. This was what Kenny discovered when he recently hired the team at Hog Roast Bramhall to cater for his daughter’s eighteenth birthday party, at his home. With around fifty or so guests coming, Kenny has asked us to provide a full spread – pigs in buns, canapes and desserts! We arrived by noon to allow enough time to set up, and have the hog roasted by the eight o’clock serving time. Whilst our chef butchered the Hog, our catering assistants, set up a gazebo and serving tables in the garden. Guests began to arrive from around six o’clock and it wasn’t long before food was served. On the menu tonight, was our famous Pigs in Buns, glorious Hog Roast served in crusty bread rolls with a selection of sauces. 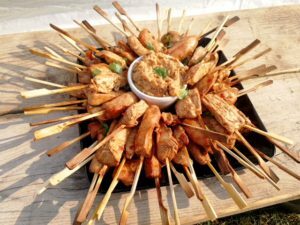 But there was also a selection canapes for guests to nibble at, which included our Halloumi Kebabs skewered with caramelised onion, the Spicy Thai Chicken Kebabs and the mini Margarita Pizzas topped with sliced Greek Olives, among others, and they were all kept warm. A little later into the evening, dessert was served, a choice of the individual handmade Cheesecakes, or the Vacherins of Strawberry and Passionfruit Cream. Kenny’s daughter Jordan, enjoyed her eighteenth with laughter and smiles, and she wasn’t the only one who helped herself to a second serving of the wonderful food, laid on by the professional chefs from Hog Roast Bramhall, who at the end of the night, tidied away discreetly and disposed of all of their waste off site. Halloween Party with Hog Roast Appleton!